This simple yet the perfect gift to celebrate special moments this valentines day. 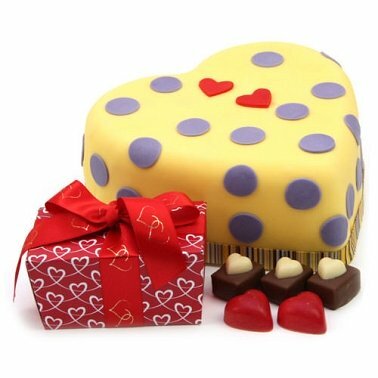 This heart shaped cake is decorated with hearts and polka dots on soft coloured icing. What a better way to say I Love you to the love of your life. Available to order online in a Choice of vanilla or chocolate sponge base with the options of personalised message card and ribbon. You can personalise this Hearts and Dots Cake free with your message printed on the ribbon up to 25 characters in the box on right. Like all of our products we are very happy to gift wrap the cake using our crisp tissue paper and a bright ribbon. Just Select “Gift Wrapping” on the right when choosing your preferred cake flavour. All our cakes are made in an environment containing Milk, Egg and Nuts. We therefore cannot guarantee that traces of these allergens can be excluded from our Cakes.